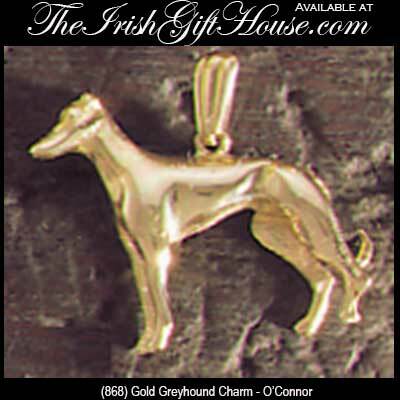 Irish greyhound charm is cast in gold and it represents one of Ireland's most popular breads. This Irish charm has been hall marked 9ct gold by the Irish Assay Office at Dublin Castle. 9ct gold is .375 pure gold and was at one time the Irish standard for export to the United States. This Irish greyhound charm measures 1" wide x 7/8" tall including the chain bail. The 9ct. gold greyhound charm is made by O'Connor Jewelry and it is gift boxed complements of The Irish Gift House. It is not surprising that O'Connor Jewelry produced greyhound charms as their facility was located adjacent to Harold's Cross Greyhound Stadium in Dublin. Did you know that the majority of pure-bred greyhounds are bred in Ireland? The first greyhound track in Ireland opened in 1927; currently there are 20 greyhound racing tracks in operation in Ireland including at Harold's Cross which was adjacent to O'Conner Jewelry.